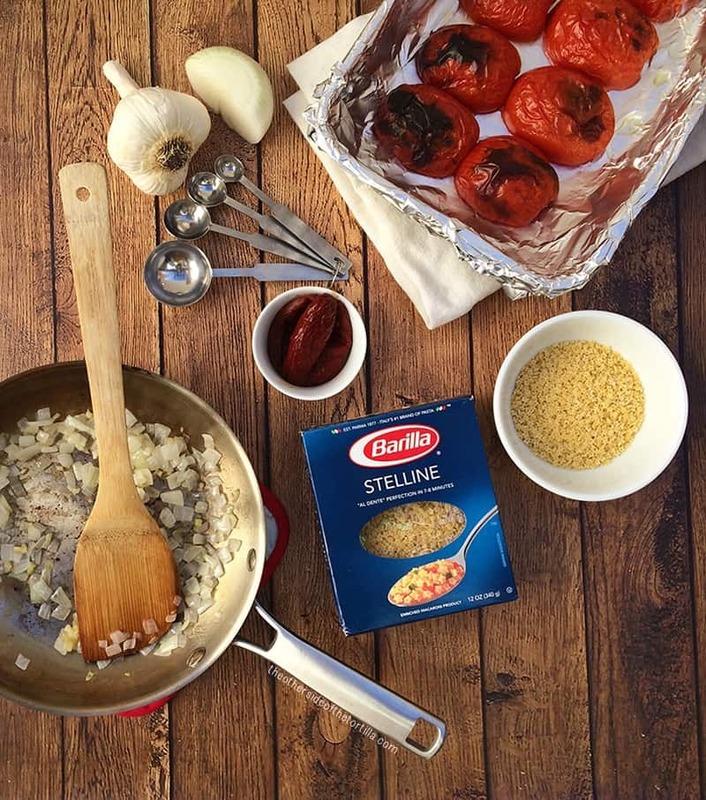 This post is part of a compensated campaign in collaboration with Barilla and Latina Bloggers Connect. 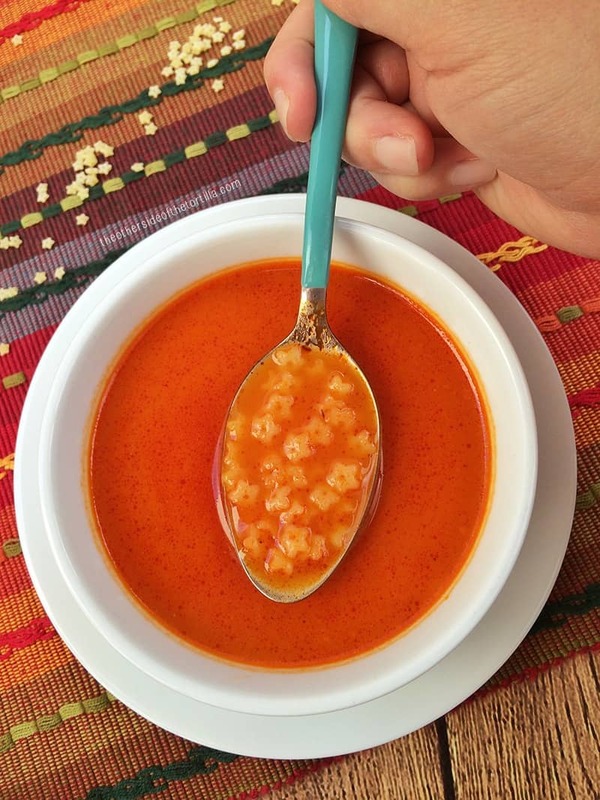 Tomato chipotle soup with star pasta is a spin on the classic Mexican comfort dish known as sopa de fideo. I love to make this soup especially during the fall and winter months or on a cool, rainy day. And the star-shaped pasta rather than regular fideo is a fun addition for both adults and kids alike! Although this soup is really not very spicy at all, if you’re worried about picky eaters, you can reduce the amount of chipotle pepper by half or completely replace the actual chile with a few tablespoons of adobo sauce. Star-shaped pasta is a classic cut that’s perfect for introducing kids to the delicious world of pasta, and in Mexico, many children’s first experience is with estrellas or fideo. Barilla, a company you probably equate mostly with Italian cuisine as it’s Italy’s No. 1 pasta brand and has been around for more than 130 years, has two kinds of star-shaped pasta available: Pastina, which is a solid star shape, and Stelline, which is star-shaped with a small circle in the middle and means “tiny stars.” For this recipe, I used Stelline, but you can use either one. Be sure to check the instructions on the box for cook time, as the Pastina has a slightly shorter cook time than the Stelline. Since the pasta will continue to cook in the soup even after you remove it from the heat, you can actually undercook it by 1-2 minutes from the box instructions so it has the perfect al dente texture by the time you serve and sit down to eat. Barilla pasta doesn’t stick or clump, and comes in a variety of cuts that makes this high-quality pasta perfect for any Mexican or Mexican-inspired dish that includes pasta for an authentic flavor. Remove the top core from the tomatoes with a sharp knife and cut each tomato in half lengthwise. Place the tomatoes cut side face down on an aluminum foil-lined baking tray and place under the broiler on high until the tomato skin starts to blacken. Remove from broiler and set aside. In a frying pan over medium heat, heat 1 teaspoon of canola oil and add chopped white onion and garlic. Stir frequently until the onion starts to turn transparent, then remove from heat. Add the tomatoes, any juice from the pan, the onion and garlic mixture, and the chipotle chiles in adobo sauce to a blender and blend on high until completely smooth. Pour the contents of the blender through a fine mesh sieve into a large measuring cup or bowl. Press the tomato mixture with a spatula to get all the liquid to drain through the sieve. Discard the tomato paste or set aside for use in another recipe. In a stockpot, heat two tablespoons of oil over medium heat until very hot. Pour the strained tomato liquid gently into the hot oil in the stockpot to fry it for a few minutes without stirring, until the puree starts to turn color to a deeper red. Add the chicken broth and salt (if desired) to the stockpot and bring to a boil, stirring to incorporate the chicken broth and the tomato puree. Add ¼ cup Barilla stelline star pasta to the soup and reduce the heat as needed. Cook the pasta for 6-8 minutes, remove from heat and serve. For more recipes and tips, visit barilla.com or in Spanish at pastaatuestilo.com. Just had a flash back! I felt like 8 years old eating my soup after school in Mexico. Loved it!